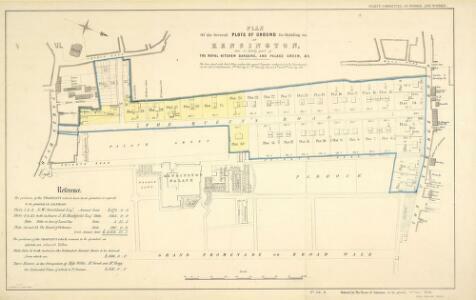 Description: This is a plan of plots of land for sale on the site of the Kitchen Garden in Kensington Gardens. The plan's title features at top centre, with compass star at top left and scale bar at bottom centre. The boundaries of the area for sale are outlined in blue, with the properties for which lease is not yet granted in yellow. Each property is numbered for reference, with key and terms of leases at bottom left.